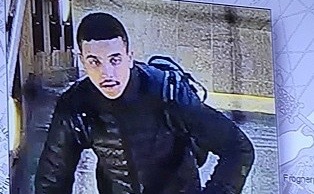 Police in Oslo now know who they’re looking for in connection with a stabbing murder and robbery at knifepoint in the Norwegian capital last week. After releasing his photo from a surveillance camera last week, police have identified him as a 20-year-old Swedish citizen from Uppsala who recently was released from prison. The suspect most wanted by Norwegian police currently goes by the name of Makaveli Lindén. His original name was Christian Bo Lindén but police said he changed it to Makaveli Lindén. “Since he still hasn’t been arrested, we chose to release his name to see if that can also give us more information regarding his whereabouts,” police inspector Grete Lien Metlid told reporters Sunday evening. He’s now being sought through Interpol all over the world, after breaking into the apartment that 24-year-old Heikki Bjørklund Paltto shared with three other roommates in Oslo. One of them found Paltto stabbed to death around noon last Monday. Police later reported that Paltto had been stabbed more than 20 times. Lindén was recognized among others by police in Sweden after their colleagues in Oslo released a photo of him taken by surveillance video at the Skøyen train station in Oslo shortly after 1pm last Monday. Swedish media have reported that Lindén has a long criminal record in Sweden, mostly for robbery in his hometown of Uppsala. In one case, he broke into an apartment in the middle of the night and threatened its residents with a knife for nearly 40 minutes while he stole their valuables. Lindén’s former defense attorney, Christer Söderberg, told Norwegian Broadcasting (NRK) that the 20-year-old was released from prison in either September or October. Swedish prosecutors had described his actions in the apartment in Uppsala as “gruesome” and wanted him imprisoned on charges of exaggerated robbery, but the court dropped the “exaggerated” term and he thus was jailed on a milder charge. He’s also been convicted in Sweden on earlier charges involving theft and narcotics. Police in Norway believe he immediately returned to Sweden after robbing a man at knifepoint in a parking garage at Majorstuen and then breaking into the apartment nearby and murdering Paltto. NRK was reporting Monday morning that new electronic tracking measures have placed Lindén in another country, indicating he traveled on from Sweden and may be somewhere on the European continent.